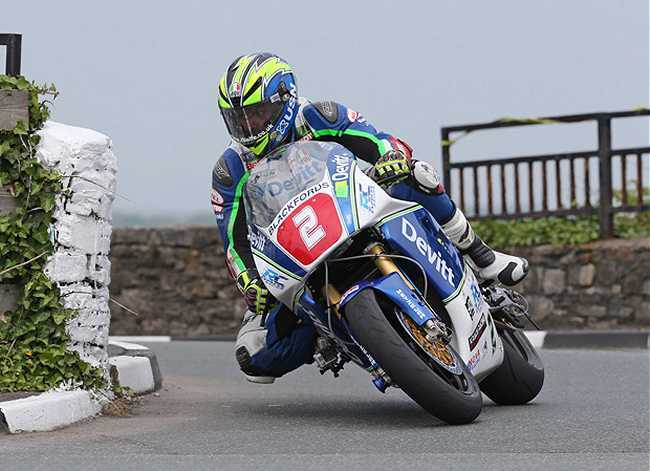 Double Lightweight TT Race winner Ivan Lintin will make his return to the Classic TT presented by Bennetts with the Lincolnshire ace riding a ZXR750cc Kawasaki in the four-lap Motorsport Merchandise Superbike Classic TT race on Monday 29th August. Seasoned Classic Racing exponent Nigel Fitzsimmonds has provided the bike, which has been built in Germany by Lothar Kraus, of Kraus Racing, to a full World Superbike specification. Kraus himself has a tremendous pedigree both on and off the track, having won the German IDM Championship in the early 1990s before becoming a crew chief in the World Supersport Championship and suspension specialist for Ohlins in the World Superbike Championship. Lintin rode the bike for the first time at the Pre-TT Classic meeting at Billown as well as having outings on it at Oliver’s Mount, Scarborough and while the 31-year suffered a nasty spill at the latter in July, losing part of his ring finger as a result, he’s expected to be on the grid for the Motorsport Merchandise Superbike Classic TT and firmly challenging for a podium position. Last year, Fitzsimmonds’ team built two Kawasaki ZXR750’s with Dan Cooper riding one entered under the Team Russell & Collins banner which gave Kraus an insight into the requirements of both road racing and, of course, the rigours of the Mountain Course. Fitzsimmonds has provided the bike through his own Equals42 Ltd company but it will run in the colours of Lintin’s regular, Devitt RC Express Racing.